Usually when I post a “please pray” blog it’s because something bad has happened. No worries, not this time!! So, a new cardiologist is attending this week, and MOMMY APPROVES!!!! I didn’t mind the last one, but he was a wee bit depressing in his “probably won’t be able to go home” kinda talk. UGH! He’d also said that “if” we go home… he would want us off oxygen so we didn’t have to deal with that at home. I had told him I didn’t actually mind having oxygen at home just in case she had a spell and needed it, but he disagreed. New cardiologist, however, says that with her history, of COURSE she would need to be sent home with oxygen at least on hand even if she’s off it. Also, I got a chance to talk with him for a good bit outside of rounds and expressed to him my frustration over seemingly differing plans and my feeling that by the first of January, if we aren’t home, we need to go ahead and do the Glenn. He concurred. I also expressed to him if we are trying to go home, I’d like a plan. A goal if you will. So, during doctor’s rounds, he asked the resident to come up with a long term “plan” for getting Annabelle home. This, by the way, has hardly EVER been done as long as I’ve been on doctor’s rounds for Annabelle. She’s always been a “24 hour window” baby. Well, her last “desat” was on Friday. She did spike a fever of 102 yesterday but it came back down with no intervention, and all her blood counts are great so we aren’t worried about infection at this point. So, IF she has NO desats in the next week…. THEY WILL LET HER COME HOME FOR CHRISTMAS!!!! To be honest, I’d given up. Last night, for the first time, Scott and I talked about what we would do on Christmas and how we could handle all the Christmas morning/lunch at my mom’s going ons and not let my baby in the hospital spend the day all by herself. This was me saying, okay God, you know best. If she needs to be here, we’ll adapt. We’ll obey. We’ll give this to you too. So, my prayer request is this: PLEASE PLEASE pray that Annabelle has NO NO NO breathing issues this week! Please pray that her sats remain above 75, that she remains fever free (not sure that is a deal breaker though…) and that the doctor’s have WISDOM in this. I do NOT want her to come home if it will be bad for her. I really don’t! Please note, even if we come home, it might very well be temporary. We might go home for a day or two and come back. The cardologist even said, “I’d like them to go home for Christmas, even if it’s just for a day.” So this home-going might be very temporary, but at this point, I don’t care. It’s a chance. And if God still comes back and says, “No”, then I’m determined to be okay with that too. God knows BEST! Merry Christmas from the Phillips’ Girls! I'm praying hard for you this morning girl! In fact I'll cheer right alongside with you! "No more desats, that's the plan, no more desats, Let's go home in your van!" May God bless you all with the Merriest Christmas of all. Krista, your post today literally brought tears to my eyes. I will be praying SO hard for you! This brought tears to my eyes too! I'll be praying with vigor!!! Praying here too–no more desats!!!! May you all be home for Christmas!!!! Home for Christmas, everyone healthy and well! No more destats, that's our new blurb. No more destats, let's kick em to the curb. Forget the rhymes, no more destats! KP, you scared the pee outta me! A big ol' PLEASE PRAY post makes me choke on my Pepsi, girl! Of course I will pray for your sweet baby girl to come home for Christmas. We kick those pesky destats out! No more destats, no, no, NO! Home for Christmas will Annabelle go! He fills our lives with happy sqeals! Ohhhh, I'm praying hard too! And your girls are adorable! What a beautiful family! Krista, I'm so glad you were able to talk with the new cardiologist and that he's given you renewed hope. It seems he really wants Annabelle to be home for Christmas if she's able to leave the hospital and will do what he can to see that she is. And the writer in me just has to say that you sure grabbed me with that hook. Wow! Praise the Lord! 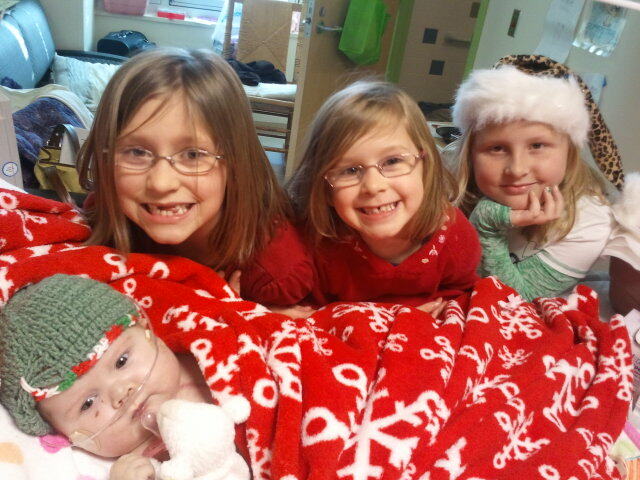 I'm glad Annabelle is doing well and continue to pray she'll be able to go home for Christmas. I'm also praying it will be a stress-free, no surprises time. Thanks everyone! I LOVE LOVE LOVE all the corny cheers!! I seriously laughed and it really did keep me pumped up! I'll go from REALLY excited to having that, "Crap, Ic an't get so excited… what if something happens and she can't come home then my hopes are up and I'll feel even worse…"
SO I'm trying to balance it, but I gotta be honest. The excitement is WINNING! Oh, Krista! I'm so happy that the end of the hospital stay is finally in sight. What a LONG year this has been for you. I don't know how you've done it and managed. Will continue to pray for you and hope that it works out for Annabelle to be at home at least for the day on Christmas!